Bridgeport is a charming neighborhood located on the City's south side. From Downtown, take 90/94 East (going south) to 31st Street. Take 31st Street to Racine. Turn left onto Racine, then your first left into the parking lot (just past 34th PL). Estimated taxi fare is $20. Estimated time - 20 minutes without traffic. Not suggested for out-of-town guests. For the experienced: Redline south to 35th Street, then take #35 bus west to Racine. OR, Orange line towards Midway to the Ashland. Walk south to Racine. East 3 blocks to venue. Estimated time - 40 minutes from Downtown. Please note that there is a White Sox game on our wedding day, so extra travel time may be needed. Please check back for transportation details. We have reserved a block of rooms at each of the following hotels downtown Chicago in order to ensure enough availability for our guests. Please mention our wedding when booking to take advantage of the room blocks. Room blocks will be available until the first week of July. See below for specific dates. Please be aware that the Lollapolooza music festival is taking place in Chicago the weekend of our wedding. This may limit the availability of other hotels or home rentals. If you are unfamiliar with Chicago and are considering renting a house or condo, please feel free to check in with us regarding which neighborhoods might be best and most convenient for your stay. We would recommend locations on the Near North Side to be close to transportation, the hotels and all of the fun venues and activities Chicago has to offer! Chicago Water Taxi: Take a ride down the Chicago River to explore The Loop or enjoy the boat trip all the way down to Chinatown. Architectural Boat Tour: Learn all about the famous architecture and history of Chicago while cruising the River. Bobby's Bike Hike: Take a bike tour, rent bikes to explore on your own, or grab a Divvy Bike at any of the hundreds of stations around the city. Montrose Harbor & Beach: Relax and enjoy beautiful views of the city from our favorite low key harbor and beach on the north side. 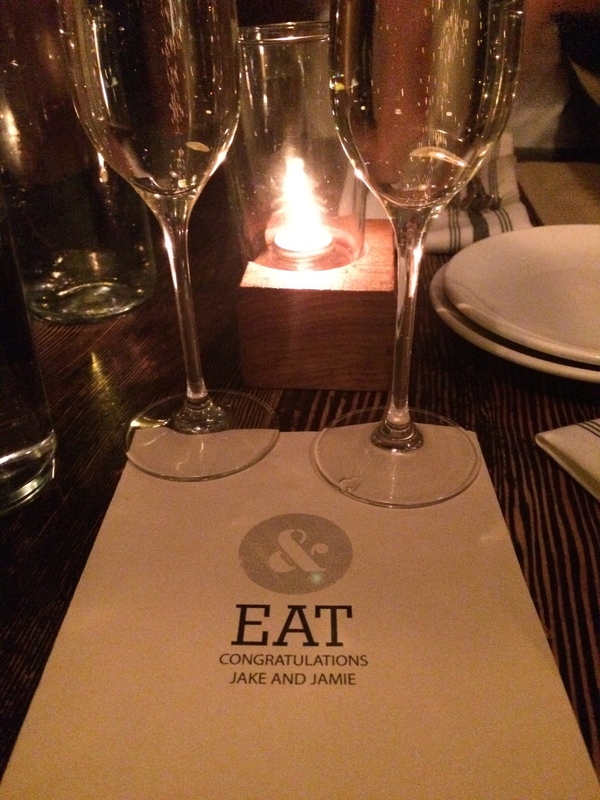 Longman & Eagle: A special place in our hearts as the site of our engagement. The food, drinks, service and atmosphere here are always on-point and the inn upstairs is truly a unique and special place to stay in Chicago. Fountainhead: A neighborhood favorite of ours with a beautiful rooftop patio and a great beer list. Maria's Packaged Goods: Great family-run dive bar and liquor store in Bridgeport. L'Patron: Authentic and delicious taqueria just blocks away from Jake's brewery. Be sure to try Jake's favorite, the Gringa and Jamie's pick the daily vegetarian taco special and elotes. Au Cheval: High end diner. Loud music, long waits and the best burgers and fried baloney sandwiches around. The Art Institute of Chicago: A favorite destination of ours. Be sure to check out the modern wing on the upper level and the Thorne Rooms in the lower level. Ale Syndicate Brewery: Jake's second home (and place of employment) and Rate Beer's "Best New Brewery in Illinois - 2014". Let Jake know if you'd be interested in a seeing the brewery and he may be able to set up a time for a quick tour. Jay Pritzker Pavilion at Millennium Park: Great place to catch a free concert or movie in the summer. Beautiful architecture and gardens in the center of the city.